Previously on BTLM we took an affectionate look back here at the eccentric football writer Eric Batty and his ever-fascinating World XIs published in World Soccer magazine between 1960 and 1992. 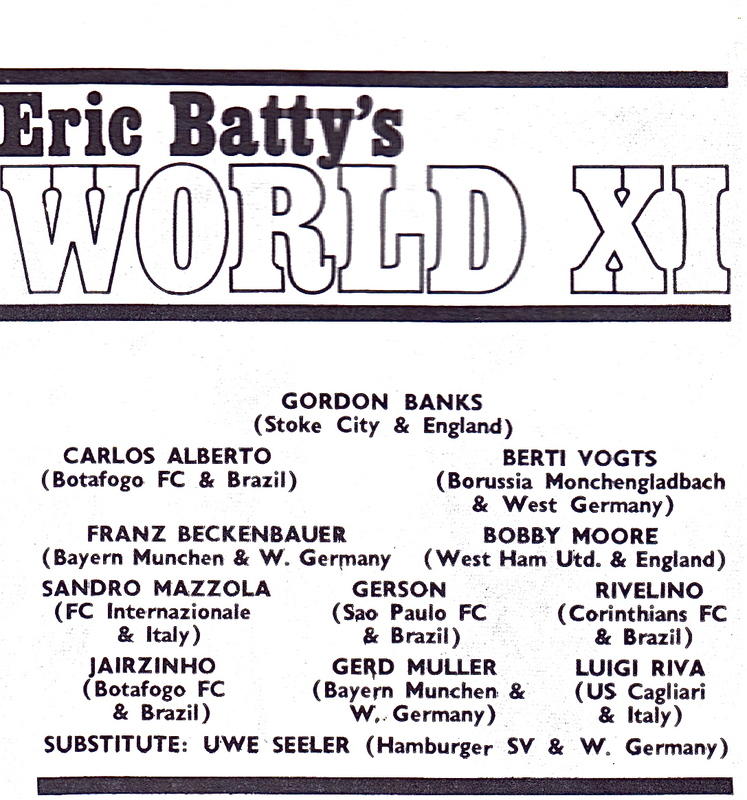 We’ve already looked in detail at the players selected for his World XIs during the 1960s, so this time round we’re focusing on Eric’s picks from the following decade – the 1970s: total football, total Eric Batty! Football had changed dramatically by the early 1970s from what it had been when Eric had started to compile these World XIs a decade earlier. Brazil might have won the 1970 World Cup in some style but this was merely a brief throwback to a fast disappearing age. The nations setting the standard during these years would be European, and more specifically Dutch and German. These countries would inspire a positive generation for the game that married technique with formational fluidity and tactical intelligence. Eric finally and reluctantly reflected these changes in his World XIs. Out went the WM formation and in came mostly variations on a 433 set-up. Out went skilful but individualistic players and in came skilful and effective team players. For reasons never explained there were no World XIs published for 1970 and 1979. For much of this decade West Germans would dominate Eric’s selections and Beckenbauer and Gerd Müller specifically were fixtures in most of them. In 1971 Berti Vogts joined them at left-back and Uwe Seeler gets a special mention as a substitute based on his 1970 World Cup performances – one of only three times Eric nominated subs with his fantasy teams. Brazil’s recent World Cup win is reflected strongly: oddly Pelé doesn’t get a nomination but Carlos Alberto, Gerson, Rivelino and Jairzinho all do. Gerson is a classic Batty choice as a deep-lying midfielder, wonderfully gifted but never willingly attempting a tackle in his life as Eric himself does concede. 1972 was the second year of Ajax’s dominance of the European Cup but this still wasn’t enough to help Eric past his general distrust of Dutch players. Cruyff is the only Dutchman represented in a team with four Bayern Munich players and five West Germans in total. The Pole, Lubanski, is back and cast out to the left-wing again while a bold pick at right back is Karol Dobiaš from the strong Czech champions, Spartak Trnava. Dobiaš loses his place in 1973 with a pair of Belgrade-based Yugoslavs, Krivokuca and Stepanovic, chosen in the full-back positions on the strength of a good performance Eric saw by them in a 1-1 draw against England. Spartak Trnava are represented this time in midfield through Ladislav Kuna with Eric overlooking more obvious candidates like Overath, Neeskens and Ball to include him. Three Yugoslavs and five Eastern Europeans in total feature this year. Scottish keepers had an awful reputation during the 1970s and it’s odd to see David Harvey of Leeds United chosen in the 1974 team. He was a decent keeper, but picking him ahead of Sepp Maier or Sweden’s Ronnie Hellstrom seemed an example of classic Eric contrariness. Cruyff is missing again and gets a good scolding for his lack of consistency over the full 90 minutes of games. His club and national teammate, Neeskens, is conspicuous by his absence too in what is another Dutch-free team. The Chilean, Rolando García, gets the right-back spot for his performance against the DDR in the World Cup and Poland’s fine generation of talent is recognised with nominations for Deyna, Lato and Gadocha. Batty likes his Slovan Bratislava players. Anton Ondrus earns a place in 1976, apparently because he once scored 4 goals in a club game from his central defensive position. Panenka is the sort of mercurial playmaker that made Eric’s stout heart beat a little quicker and he’s duly selected despite an acknowledgement that he lacks stamina. Dynamo Kiev’s rise as a force in the European game is reflected in the inclusion of Viktor Kolotov and Oleg Blokhin. Johan Cruyff makes a belated comeback to the 1977 team and the Dutch have their best year under Eric so far. There’s four of them in this team alongside the five West Germans. Brazilian central defender Luis Pereira and Italian midfielder Franco Causio are the only interlopers from outside those two northern European neighbours. It’s rare for Eric to pick a couple of out-and-out centre-forwards to play alongside each other, but in 1978 Müller and Bettega are paired in an attack-minded 424 team. The Peruvian hammer of the Scots, Teófilo Cubillas, gets a midfield place. Eric states that he had picked him for his 1970 team although no World XI was actually published that year to back up his claim. Manchester City central defender Dave Watson is selected as Eric follows the trend of the day to have a stopper and sweeper combination. The Brazilian Luis Pereira once again performs the sweeper role. Cheers, and to you. The last part of the Batty Years will probably by posted in January. Nice, that would be absolutely great! Do you maybe know similar historical XIs by other magazines? Mail is beyondthelastman@gmail.com. the 80s Batty post will be up this coming week or next. Cheers. Perhaps he wrote on in secret, in the back of an exercise book. I think just a publishing error that the 70 version never made print.